Today I had an idea for a Rosh Hashanah project. 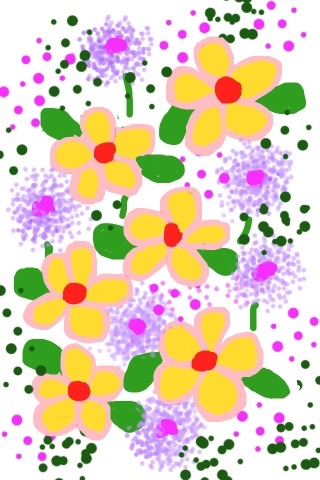 This is going to be a video animation created on my iPad with the Brushes app. The Brushes app captures a stroke-by-stroke video as you draw, so to make the animation work, you have to think about not only what to draw but in what order. I knew I wanted to include an apple tree branch, honey, honey comb and honey bees spelling out 5777. So I did this very quick and very rough draft to see if the idea has possibilities. I am still editing the pictures I took last week, riding the train from Baltimore to Boston. This one is a view of houses along the water. 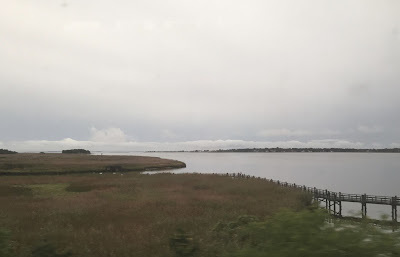 I am still editing some the of photos I took last week while I rode the train from Baltimore to Boston. I am not sure where this was taken because there are water views almost the whole way. But I think this is probably somewhere in Connecticut. 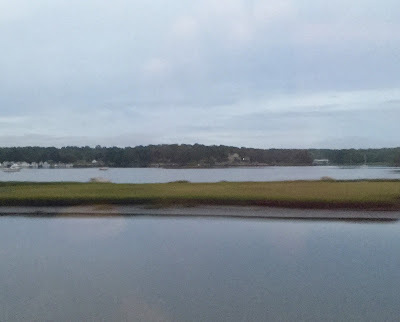 I love trains and there is something wonderful about looking out the window of a train and seeing boats on the water. 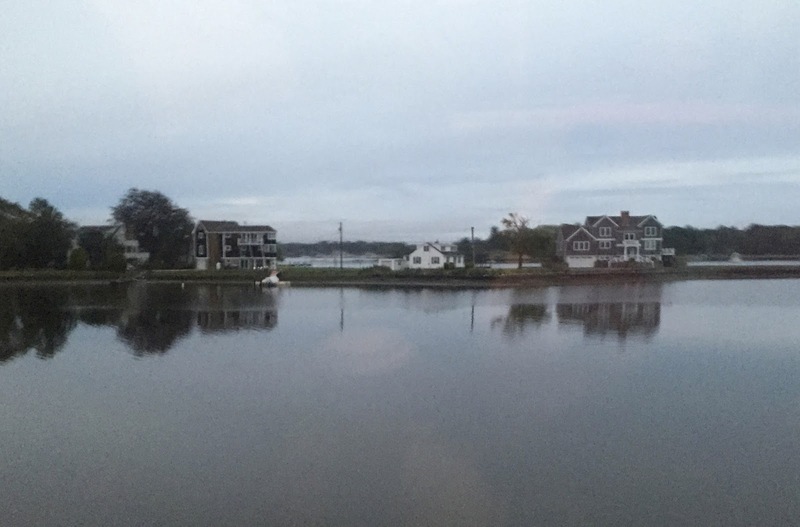 Here's another photo that I took last week on my train ride from Baltimore to Boston. This is another view of the walkway (see yesterday's post), along with more of the wetlands. Tonight I cropped the original photo to get this composition. 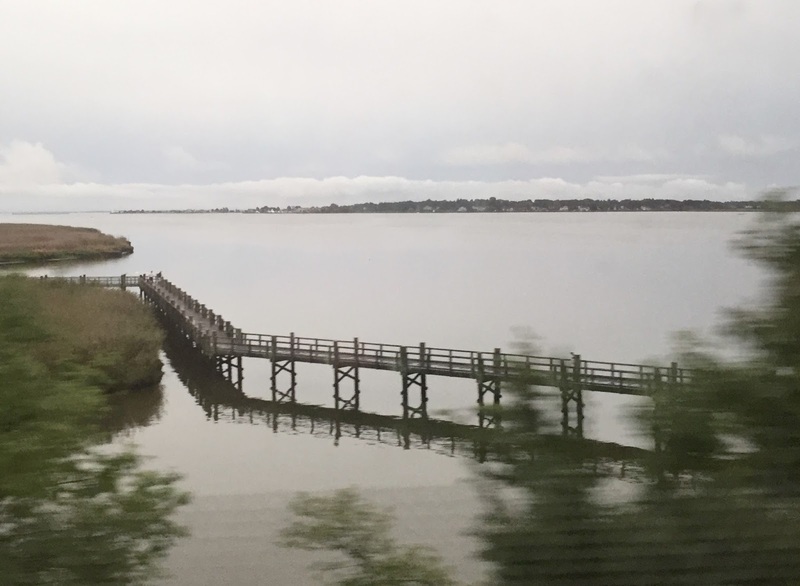 Here's another image from last week's train ride from Baltimore to Boston. I looked out the window and saw this walkway over the water and took a picture. I am not sure where this is. I guess I had my location turned off. 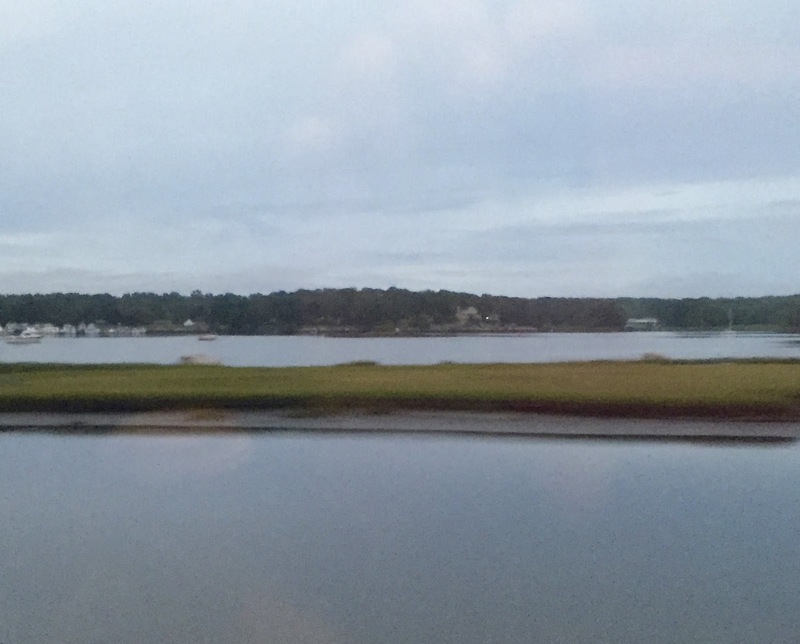 There are water views most of the way between Baltimore and Boston. Today I edited it to get this composition. Despite the blurred trees, I think this might work as a reference photo for a painting. 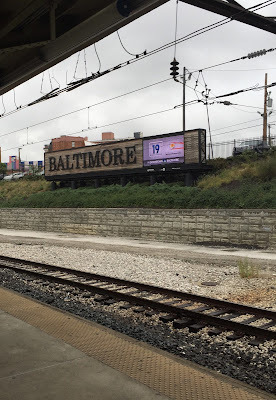 Last Monday I took the train back to Boston from Baltimore. When a window seat finally opened up, I moved over and started taking pictures with my iPhone. This is the first picture I took. Tonight I edited it to get this composition. Here's one last picture that I took at Baltimore Penn Station, just before the train to Boston pulled into the station. On the train down to Baltimore from Boston, I didn't take pictures because I was too busy talking to my Aunt Edy as we rode the train down to her new home in Baltimore. 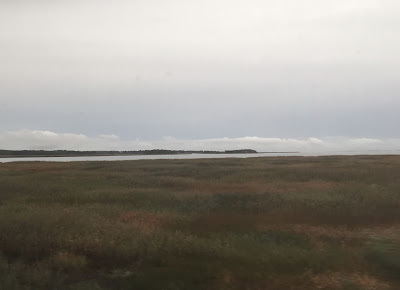 But it is a beautiful train ride, and I took plenty of pictures on the way back home. Now that I am back home from my travels, I am editing some photos. The timeline is tangled because it was a complicated trip and I was too busy to blog in "real time". 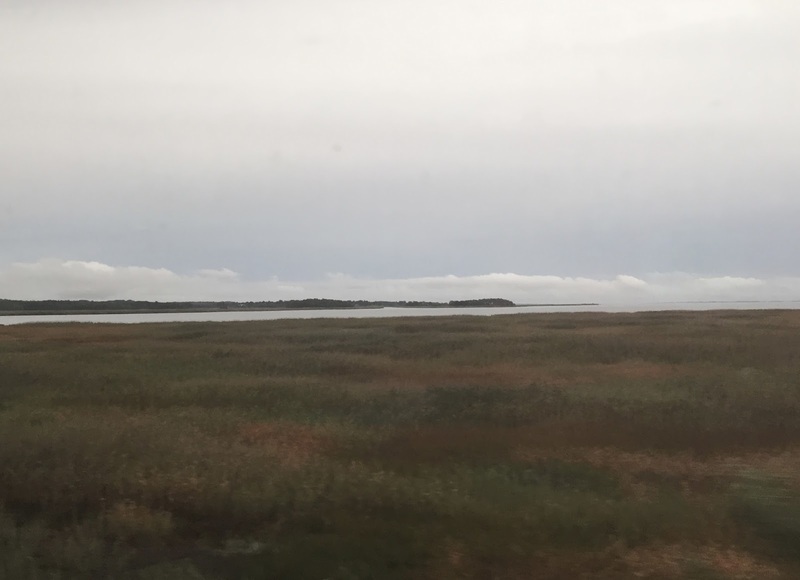 At the end of the Colorado part of the trip, Aunt Edy flew back to Boston with me and after several days visiting in Beverly, we boarded an Amtrak train to go to Baltimore, where she is moving. I had a chance to see some cousins and catch a sneak peek at the new house. But then it was time to catch the train back to Boston. My excellent adventure with Aunt Edy was over and I was sorry to see it end. 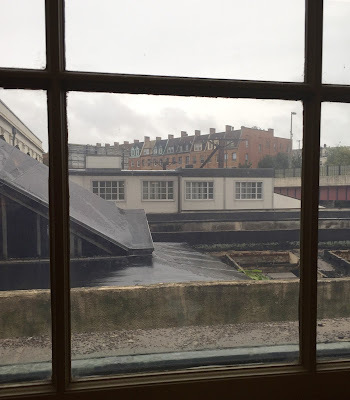 I looked out the window at the train station, and the scene seemed to match my mood, so I took this picture. There will be more adventures with Aunt Edy in Baltimore. Time to board. The guest artist, Edythe Sigman, is my Aunt Edy, 97 years old. She has been making jewelry for about 10 years, something she decided to try at age 87 after cataract surgery improved her vision, so she took some lessons at a bead store. During my recent trip to Colorado, she showed me over 100 pieces that she has made. This necklace is one of three that she gave me: cane glass with an intricate pattern of very small black and blue beads. 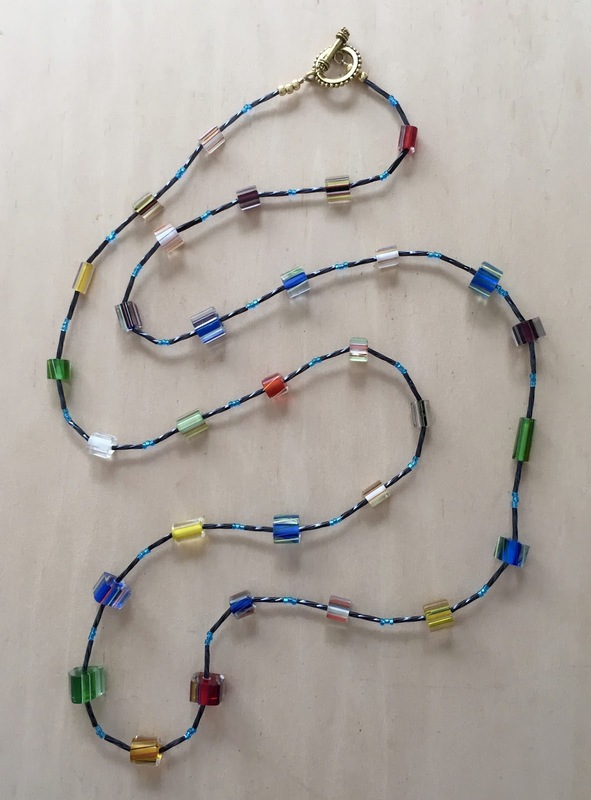 It's a long necklace and can be doubled. When I unpacked from my trip, I decided to photograph the necklaces and post them here. Here is a photo of another necklace that I brought home from my recent trip to Colorado. It was created by my Aunt Edy (Edythe Sigman) who is 97. She started making jewelry about 10 years ago when cataract surgery improved her vision. Last week I helped her pack for her move to Baltimore, and she showed me about 100 pieces of jewelry that she has made. But she said she had me in mind when she made this one, which makes it pretty special so I wore it right away. 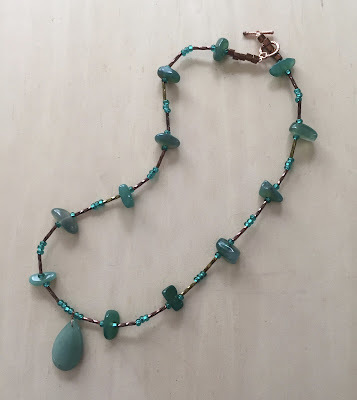 This is green agate combined with green and copper-colored beads. The guest artist is my Aunt Edy who is 97 years young. She started making jewelry about 10 years ago, after cataract surgery improved her vision. During my recent trip to Denver, I helped Aunt Edy get ready for her move to Baltimore. We ran errands all over Denver, we packed boxes, and suitcases, but somehow we managed to make time to look at over 100 necklaces she has been making. She gave me a few of them, and I wore them during my trip. While I was unpacking today, I decided to photograph my new necklaces and post them here. 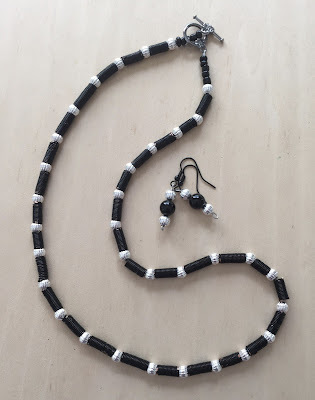 Aunt Edy not only designed this necklace and earring set, she also made the beads by winding wire into tiny coils, using on a device called a gizmo. Today I had a sneak peek at my cousins'/aunt's new place in Pikesville, MD: great kitchen, super fireplace, a screened porch. 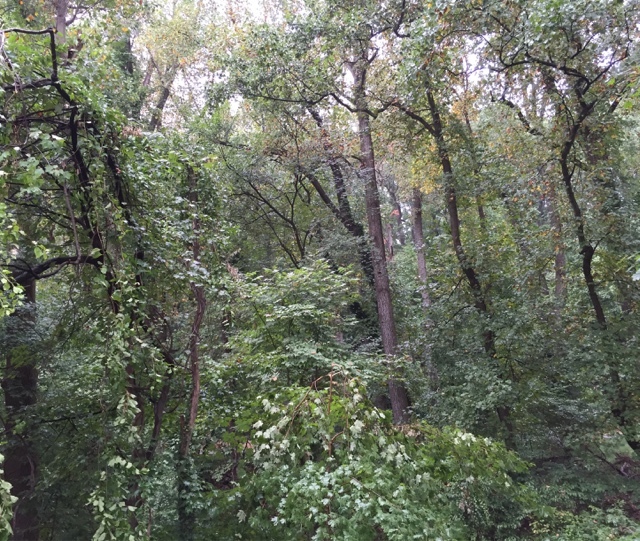 And a great view of the trees from the new deck. Of course I took some pictures. Here's the best one. 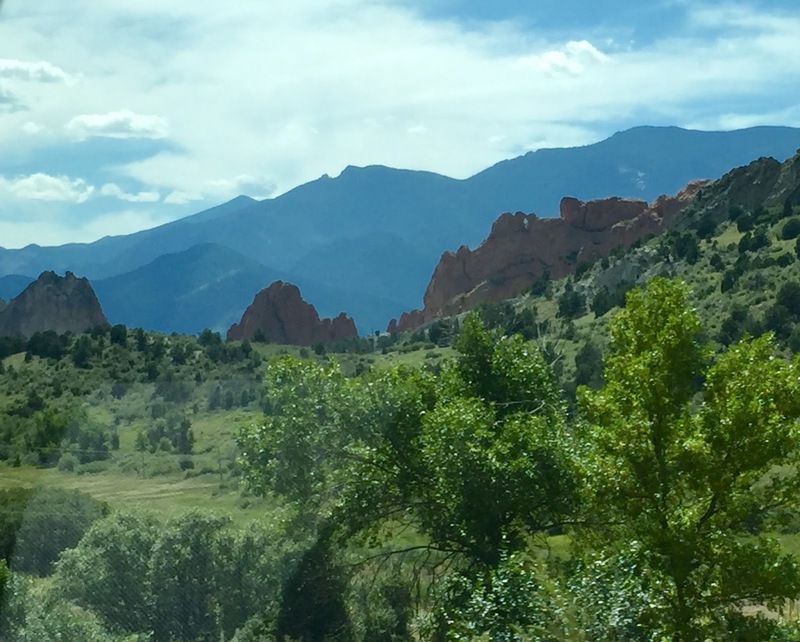 One more photo of Colorado Springs. 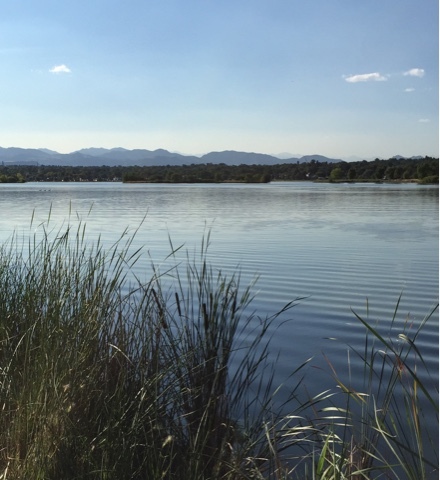 This a view of Pike's Peak in the distance. 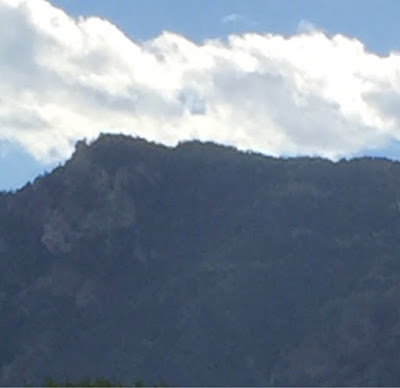 Today I cropped this image out of a photo that I took from my friend's car as we drove towards the mountains. I am still editing my photos from Colorado. Here is one more taken on Sunday, Sept. 11. 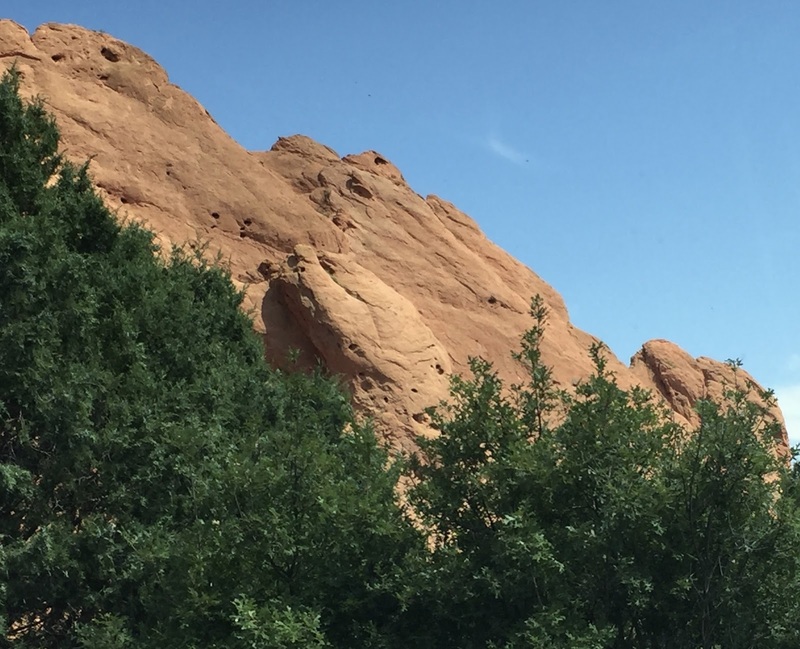 This view shows two Colorado spectacles in one: the layered blue lines of the Rocky Mountains and the red rock outcroppings of the Garden of the Gods. 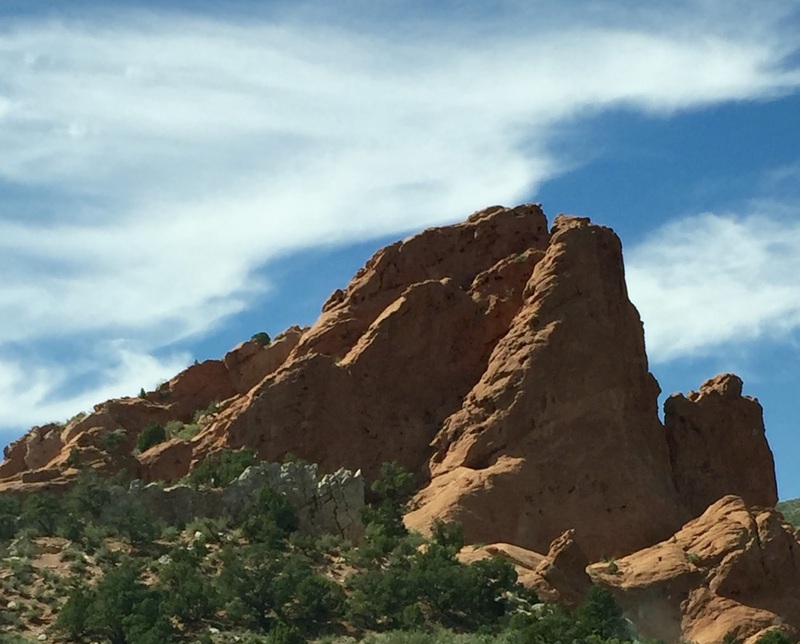 I took this photo through the windshield as my friend Herman drove toward Garden of the Gods. Today i cropped this image out of the original version to get this composition. 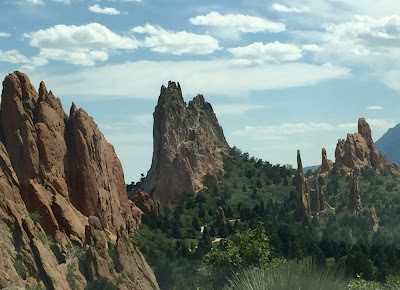 Near the end of my trip to Colorado, my friends Herman and Kerry surprised me with a ride through the Garden of the Gods. We also drove through Manitou Springs, which I loved to visit when I was growing up. I took this photo through the windshield of the car and later cropped it to get this composition. 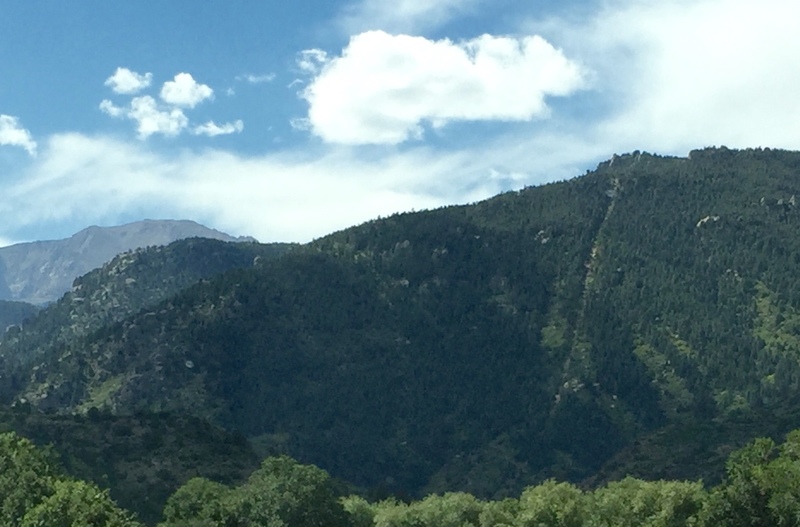 You can see the Manitou Incline on the face of the mountain. Here's another image from my drive through Garden of the Gods during my trip to Colorado. 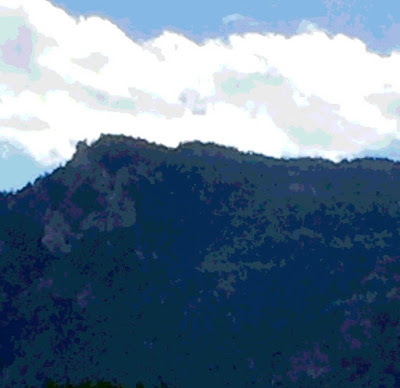 I edited this image to focus on the outcropping and the simple composition of three Colorado colors. Here's another image from my trip to Colorado and the lovely ride through Garden of the Gods with my friends. I took the original photo through the windshield of the car. Later I cropped the original version to get this composition. I also adjusted the contrast a bit. Here's another photo that I took during a drive through Garden of the Gods (September 11). I love the look of layered mountains in shades of blue and the unmistakable color of the Colorado soil. 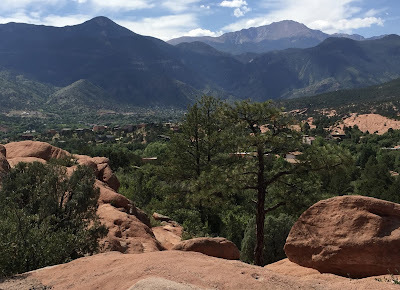 On my last day in Colorado Springs, my friends Herman and Kerry took me on a ride through Garden of the Gods. I took lots of pictures. The original version of this photo was shot through the front windshield. But I cropped the original to get this composition. 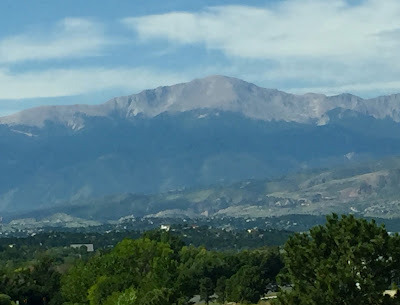 I recently flew out to Colorado to attend my 50th high school reunion, and to visit my cousins and my aunt in Denver, although they were days away from a big move to Baltimore, Maryland. The schedule was pretty hectic, with reunion events, visiting friends and family, and helping my aunt run errands and pack up her things. So I knew there wouldn't really be any time left to see the mountains or do some sightseeing. 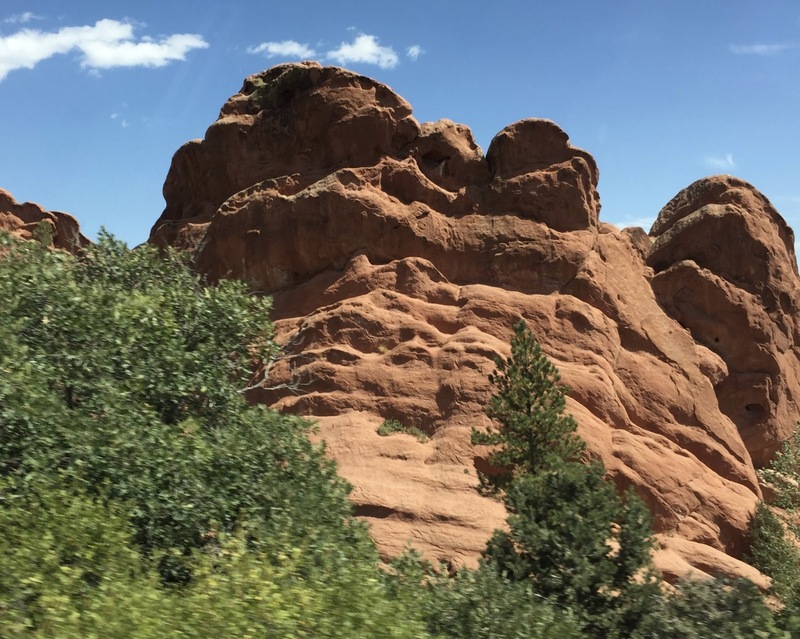 But on my last day in Colorado Springs, my friends Herman and Kerry surprised me with a drive through Garden of the Gods. I hadn't been there in years and years, and it was amazing. I took a lot of pictures, including this one of balanced rock. 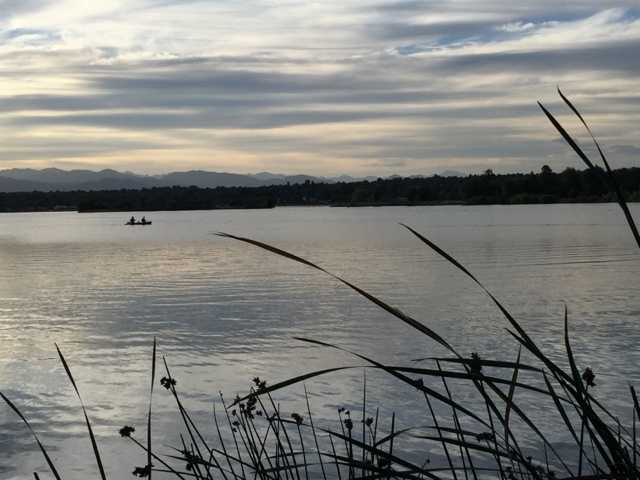 I had a busy day in Denver today, but late this afternoon I took a little walk to Sloan's Lake to get another view of the mountains. Tonight I cropped the original photo to get this composition. Finally had a chance to take a picture of of the mountains today, from Sloan's Lake. It was near sunset, th golden hour. No filter needed. Today I flew from Boston to Colorado, my home state. To amuse myself on the way, I decided to draw, using the Brushes app on my iPhone. It was a pretty smooth flight. I am not sure what kind of flowers these are, but I am calling them "Neighborhood Flowers" because we have been walking past these flowers every time we talk an evening walk through the neighborhood, which is quite often. I finally decided to take a picture, and tonight I cropped the original to get this composition. 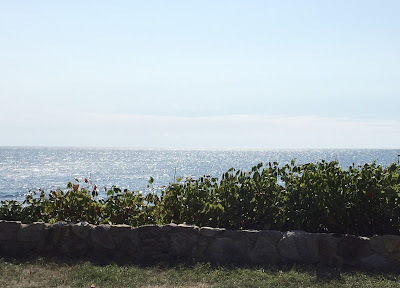 This morning, we drove up to Magnolia (Massachusetts) to have brunch. Magnolia is near Gloucester, MA. The downtown is basically one street, but it has beautiful coastal views. When we got near the water, I took a picture. When I first spent time near the ocean, I realized that the line from the song "from sea to shining sea" isn't just a metaphor. The sea really does shine sometimes. I also used my recent photo of cherry tomatoes to try out my Prisma app. For this image, I chose the "Caribbean" filter. I like the fact that you can control the amount of filter that you use, but in this case I used the filter at 100%. Yesterday's post was a photo of some cherry tomatoes, seen from above. Tonight I tried adding some posterizing effect, using my Painter software on the my computer. I had to do some adjustment on the background color with some color overlay. I also used some color overlay to make the highlights on the tomatoes a bit more subtle. Well, it's Thursday, the day we get our farmshare from our CSA (Community Supported Agriculture). 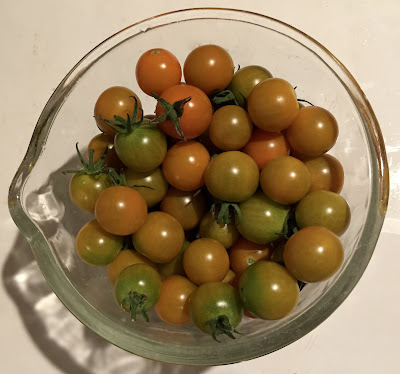 So now I have a bowl of cherry tomatoes on my counter, thanks to my daughter, who picked them over at Long Hill Gardens, in the Food Project's field. Cherry tomatoes are the candy of vegetables! But they are also eye candy. 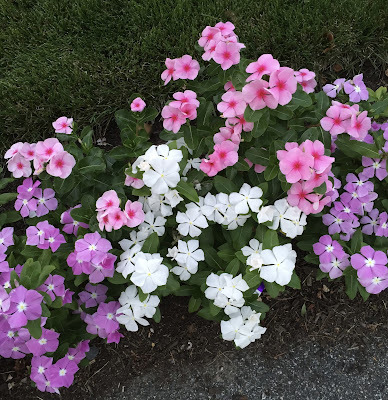 Tonight I caught myself admiring them, so I decided to take this picture. It's hard to get a good photo at night, but I tried an aerial view. Then I cropped the image to square the circle.